You know how a chair with shut windows makes you drowsy! This man strikes my head with a beam, that one with a barrel. From every side, while a soldier’s hobnailed boot pierces my toe. Do you see all the smoke that rises, to celebrate a hand-out? There’s a hundred diners each followed by his portable kitchen. With all the rest that the poor little slave transports, on his head. Fanning the oven, he runs along, his body held perfectly upright. As it looms near, while another cart’s bearing a whole pine-tree. They teeter threateningly over the heads of those people below. The oily back-scrapers; by full oil-flasks, arranging the towels. Over the muddy river, and no coin in his mouth for the fare. Juvenal’s lines provide us with a lively poetic imagination of the busy streets of ancient Rome – and they have inspired many a visual representation of Roman streets in literary fiction and the arts. Traffic jam in ancient Rome. – Image source: https://s-media-cache-ak0.pinimg.com/736x/6b/2d/37/6b2d37290f1981334355867c5196e00d.jpg. The beauty of literary imaginations is, of course, that it easily dispenses with our sense of immediacy and relevance – safely relegating stories to the world of fiction and fantasy, which, if they were to be encountered in one’s real life, could be deeply traumatic and disturbing. Traffic- and vehicle-related fatalities from ancient Rome are, of course, occasionally recorded in the Latin inscriptions – and sometimes those mentions appear in a poetic form themselves. The assumption that these poems refer to actual fatalities create a remarkable tension between the potentially pleasurable artifice of poetry, their graveyard setting, and the harsh reality of life (and death) they describe – these texts simply cannot be enjoyed in the same way as Juvenal’s amusing description. To the Spirits of the Departed. For Lucius Valerius Magnus. Lucius Valerius Euaristus and Murria Ampliata (sc. had this made) for their most dutiful son. You, whoever you are reading our inscription and asking for the name, behold the fate through which my life-breath has been snatched away from my face. During the course of the ninth year since the beginning of my time (sc. on earth), while I suddenly – incautiously – haste to help my brother, a wheel crushed me, as I had stumbled … [the remainder of this inscription is too fragmentary for a meaningful translation]. vix(it) an(nos) XIII. P(ublius) Ummidius Anoptes lib(ertus) fecit. This pile covers the spirit of Ummidia as well as that of Primigenius, the home-born slave, both of whom a single day snatched away: for when they were crushed by the swarm of the crowds of the Capitoline hill, they both reached their day of destiny. For Ummidia Ge and Publius Ummidius Primigenius (he lived 13 years). Publius Ummidius Anoptes, freedman, had this made. 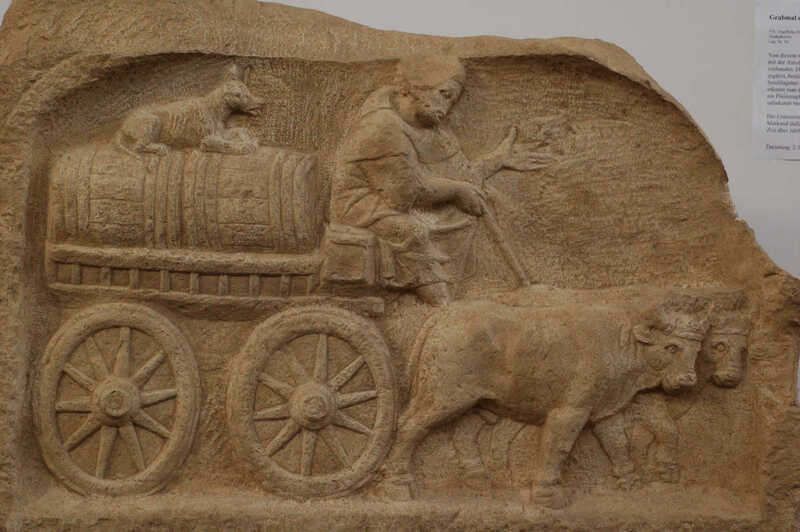 Roman oxcart. – Image source: http://www.electrummagazine.com/wp-content/uploads/2014/02/Roman-wine-trade-Augsburg-Romam-Museum.jpg. Q(uinti) Volusi Sp(uri) f(ilii) Lem(onia) Anthi. dum ludit fati conruit invidia. ignarum rector propulit orbe rota. annis pro pietate pari composuere suo. Siliae (mulieris) l(ibertae) Nice C(aio) Silio Antho. in fr(onte) p(edes) VI in agr(o) p(edes) III S(emis). To the Spirits of the Departed of Quintus Volusius Anthus, son of Spurius, of the tribus Lemonia. As the little boy happens to play around, under the protection of a common parent, he falls down, due to the envy of fate. For a carter, with inexperienced yoked wild oxen, ran over by accident the unsuspecting boy, with the rim of his wheel. After both grieving parents performed the wretched funeral and gave the final offerings to the deceased, they erected this memorial for Anthus, out of their commensurate sense of parental duty. Quintus Volusius Anthus, freedman of Quintus, the father, had this made for himself and for Silia Felicula, freedwoman of a woman, his most innocent wife, and for Volusia Nice, daughter of Quintus, Quintus Volusius Anthus, son of Quintus, Silia Nice, freedwoman of a woman, and Gaius Silius Anthus. (sc. This plot is) 6 ft. wide, 3.5 ft. deep. Of course, humans were not the only casualties of ancient Roman traffic, as Mary Beard recently reminded us with reference to a Greek inscription (of Roman Macedon). 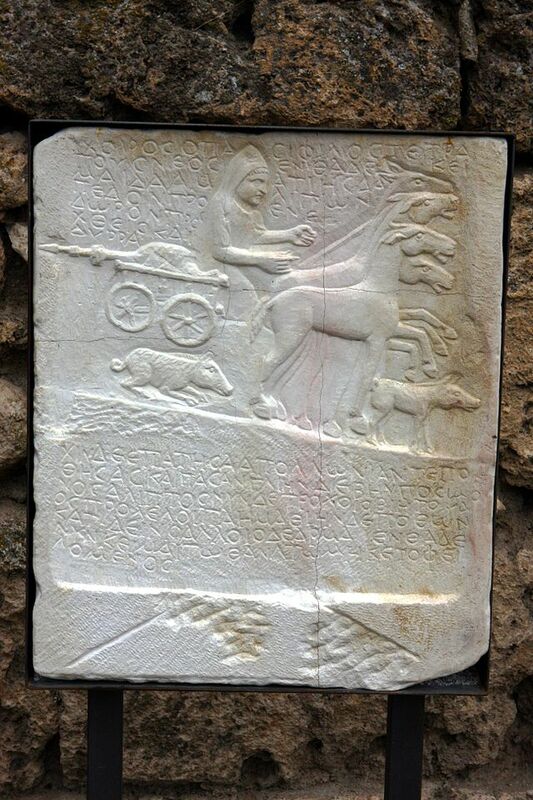 Epitaph for a pig killed in a road accident. – Image source: http://timesonline.typepad.com/.a/6a00d83451586c69e201bb08075c77970d-popup. This entry was posted in Carmina Epigraphica, Epigraphy, Poetry and tagged ancient Rome, Carmina Latina Epigraphica, Child death, Death, Fatality, Road casualty, Traffic accident. Bookmark the permalink.